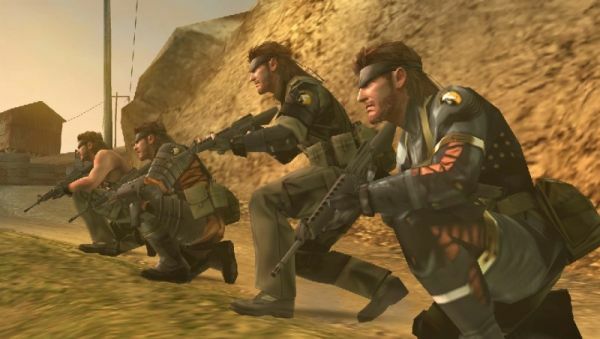 For a while now we've been curious about the Metal Gear Solid: Peacewalker trailer that showed us 4 Snakes in different gear on screen at once. Did it mean co-op for us? Why yes, yes it did - they just weren't ready to tell us yet. Now, we have a confirmation in the new trailer. It starts out with brief sentences breaking up the Snake action like a silent movie, explaining how alone Snake in his solo campaign against the world. Then, another Snake enters the scene with the text "...A comrade?" Followed by "Solo No Longer!" Then finally "Co-op." Co-op has indeed been confirmed for the PSP game Metal Gear Solid: Peacewalker with this trailer. We can't wait to hear more of how this PSP co-op will work! Perhaps we'll have more interesting Snake names to add to Solid, Liquid, Solidus, Old, or Naked. What would you code name your Snake?